Chicken nuggets should be fried according to the size of the nugget and the coating that is on them. A chicken nugget that is 2 inches long and 2 inches wide should fry until it is golden brown. This will take about 3 to 4 minutes. 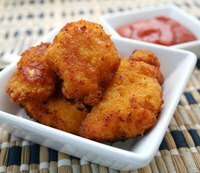 Nuggets will also take a minute or two longer to cook if they are in a thick batter as opposed to a thin one. The temperature of the frying oil directly affects how long the chicken nuggets need to cook. Most recipes recommend a frying temperature of between 360 to 375 degrees F for a cooking time of 3 to 4 minutes. Larger nuggets or a lower oil temperature means the nuggets will need to cook longer. Fry your chicken nuggets for 3 to 4 minutes on each side. When the nuggets reach a golden brown color, test one by pulling it out of the oil and cutting it open to make sure the chicken is done. It should be white all the way through.